Home Hall of Fame Springbok Birthdays …..
Johan “Rassie” Erasmus made his international debut against the British & Irish Lions in Johannesburg on July 5, 1997 and scored the first of his seven tries in his second Test in the 61-22 drubbing of Australia in August that same year. Erasmus possessed one of the best rugby brains of his generation and did extensive tactical analyses throughout his playing career. By 1998, he had established himself as a first choice flank and played in three of South Africa’s Tri-Nations winning Tests that year. After the 1999 World Cup, where he played five matches for the Boks, he captained South Africa in the match against Australia in Brisbane on June 17. 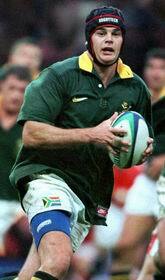 He played a further six Tests in 2000 and two in 2001, both against France. The 20-15 win in the second Test in Durban proved to be Erasmus’ last game for the Boks. Erasmus made his provincial debut for the Free State Cheetahs in 1996 where he formed a devastating loose trio with the Venters, André and AJ. He moved to the Lions in 1999 and captained the Cats to the Super 12 semi-finals in 2000. After his playing career, Erasmus went into coaching and guided the Cheetahs to Currie Cup glory in 2005 – the Bloemfontein-based union’s first Currie Cup title since 1976. The following year, his Cheetahs side shared the Currie Cup trophy with the Blue Bulls and he became the first ever coach of the Cheetahs Super Rugby franchise when they were accepted into the Super 14 that year. In 2007, Erasmus served as technical adviser of the Springboks before he took up the position of coach of Western Province and the Stormers.